Oh, to have my very own island in the Venetian lagoon. Thence, on a sunny morning, I could sail over to the Grand Canal to look at a few priceless paintings in the Ca’ Pesaro before a leisurely lunch in the most beautiful city in the world. In the afternoon heat I could return to my retreat and sit in a shady corner and sip Pimm’s Number One (do you remember when there were numbers One to Six, each with a different spirit base?) and marvel at the sparkling brightness of its cubes of ice, as an evening of good food and fine wine approached. An idle day dream? Not at all. I have done it. For I have been to stay at the San Clemente Palace. 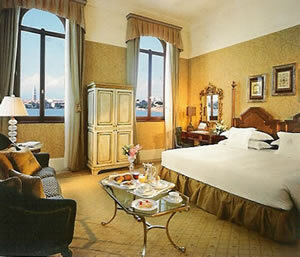 Venice has many wonderful hotels. This one is a magnificent 200-bedroom recent addition to the hostelries of a town which has been welcoming visitors for centuries. It occupies the whole of the Isola San Clemente’s five acres, which lie a 15 minute ride in one of the hotel’s handsome boats from the centre of Venetian life, St Mark’s Square. 900 years ago, the island’s position attracted monks and a monastery was established. The pretty chapel (mostly 15th century) stands today restored and pristine – as do the rest of the buildings, arranged around large, open courtyards. Within, I was struck repeatedly by the vast, airy corridors, which impart a most pleasing sense of spaciousness and luxury. We all know that much of Venice can become rather crowded in high season, but here green lawns stretch into the distance and accommodate not only tennis courts and a swimming pool, but also a pitch-and-putt golf course. I stepped carefully out of the water taxi from the airport (allow a hundred euros for the fare) and was immediately captivated by the verdant splendour of these grounds. I left my luggage near the jetty for the porters and sauntered up the long, straight path to the main entrance. First impressions count at luxury hotels. Everything must be immaculate and good taste must be evident in every view. I am pleased to report that those who have spent many millions of pounds on the restoration of the San Clemente Palace share these views. The paintings by Titian and Tintoretto on the walls are, alas! only copies, but they set the tone for the extensive and comfortable public areas. There is even a room with computer screens and free access to the internet, so that a stay here will not deprive you of your regular diet of Bown’s Best and Bown’s Bespoke. Breakfast is had in the Gli Arazzi rooms, several handsome chambers on the ground floor. Crystal chandeliers and 18th century Aubusson tapestries oversaw my excursions to the buffet, from which I took to my table bacon, orange juice, croissants, melon, pineapple and slices of chocolate cake – all of excellent quality. On one morning I broke my fast outside, by the old cloister, and consumed these comestibles while sitting next to a bed of geraniums and a lion’s head carved in stone. I found the waiting staff on these occasions most solicitous. I liked, too, the crockery – which, on close inspection, turned out to have been made in Germany, by Schönwald. Apart from the restaurant by the pool (I am not a lover of the sun-tan, so I am seldom to be found near such facilities), there is the highly regarded Ristorante Le Maschere, to which I made my way as the sun began to set. 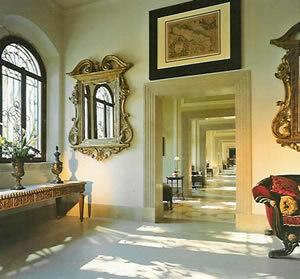 It has a collection of paintings by a local artist, Eremita, in its attractive dining room. But the weather was warm and it seemed right to dine al fresco. Thus did the excellent maitre d’, Mauro Martellozzo (smart in black tie), show me to a table on the outside terrace. Immediately, I was glad he had done so. I was right next to the water of the Lagoon, which lapped gently to within a few feet of my shoes. Ahead was a vast liquid panorama, with the far-off churches of the Redentore and Santa Maria della Salute poking their domes into the bronze of the early evening sky. I could clearly make out the campanile in St Mark’s Square. This was a magical spot for dinner. On the table, the napery was beige in colour and the glassware was by Inn Crystal. A moment passed and an old friend came up to greet me. The last time I had encountered Massimo Leimer it was at the famous Ristorante Savini in Milan. Now, it transpired, he is the Food & Beverage Manager here, at the San Clemente Palace. We had a brief chat and then I settled back for a good meal. The wine list has about 250 offerings. The following caught my eye, and will give you an indication of the prices: 1996 Dom Pérignon rosé champagne (520ε), 1996 Yquem (591ε), 1996 Chateau Ausone (561ε), 2002 Solaia (192ε) and 2006 Planeta chardonnay (58ε). I drank a super-Tuscan which was new to me. This 2001 Summus (Banfi - 69ε) was plump, with soft tannins and an abundance of ripe damsons and went very well indeed with the beef. 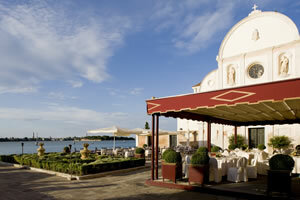 It is, it is a wonderful thing to have your very own island in the Venetian lagoon. And that is what the San Clemente Palace offers to its guests. Who says that dreams do not come true? Isola di San Clemente 1, San Marco, 30124 Venezia, Italy.